Vedant Kanoi is the Co-founder and CEO, FoodCloud.in. Based out of Delhi, India, FoodCloud is a unique platform that enables you to order delicious home cooked food from professional chefs who work from home. You can browse by cuisine, chef or a dish, which will give you a list of chefs and dishes to choose from. You can choose the dishes that you like after which you can specify the quantity required and your delivery details. Once you place an order, you will receive an email with all the details of your order including the contact details of the chef. Vedant completed his graduation from Carnegie Mellon University and then worked at UBS Investment Bank after which he started his first startup called BatchBuzz, which was an online user generated magazine. In an exclusive interaction with The Motiverge; Vedant Kanoi, Co-founder and CEO, FoodCloud tells more about the venture, journey so far and future plans. TM: Tell us more about FoodCloud. When was it established? Vedant: FoodCloud was established in December 2014, but we launched with delivery and full services around April – May 2015. We connect foodies to chefs who make delicious and authentic food that is not available in restaurants. FoodCloud allows them to order and enjoy exotic home-made meals every day at their doorstep. The menu consists of huge variety of cuisines that vary from North Eastern to Bengali, Rajasthani to coastal south, traditional Rajput cuisine to Punjabi food, Oriya, Goanese, and simply what not. With an addition of over 10 international cuisines, we also offer cuisines made of organic ingredients, gluten free to Eggless desserts. Moreover, we enable passionate chefs to become homepreneurs without making large capital investments while delivering food that satisfies the taste buds of a large number of food lovers. TM: What was the biggest turning point in your life that changed your mind to become an entrepreneur? Vedant: Ever since I was a child I was interested in business, I would love putting up games stalls in Fetes and Melas. I was always encouraged by my parents to take these opportunities to learn and grow. Creating something with a team of people and working towards a common bigger goal is always satisfying. TM: How big is your team? Vedant: At present, we have 20 members in our team. 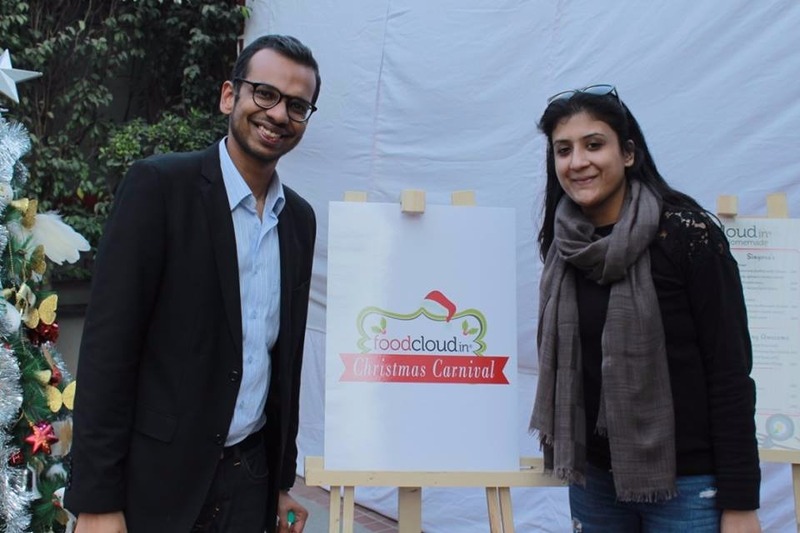 TM: What makes FoodCloud a one-stop online food delivery platform for foodies? How does it work? Vedant: FoodCloud is the only platform on which you can find and order truly homemade food. It’s not restaurant food. It’s not home style food. It’s real home food. Customers looking to order fresh, healthy and authentic flavours from India or around the world, at a reasonable cost and in the comfort of your home, choose FoodCloud. On our platform you can find simple and healthy daily meals to gourmet food fit for your next celebration, all at prices that are 30% cheaper than restaurants. FoodCloud allows you to enter your location and see the home chefs serving a 35+ cuisines around you. You can filter using cuisine, delivery time etc or just search for your favourite dish. Once you choose your chef and place the order from her menu, the chef will be notified of your order and he/she will prepare it as per your time of delivery. We will then pick up the food from the chef’s home and deliver it at your doorstep. TM: How has been the journey so far? Vedant: The journey till now has been truly amazing. When we started out we have around 20 home chefs on our platform and today we have over 1500 registered. What inspires us is the opportunity that our home chefs are getting to showcase their talent and to earn money while doing this. Also, being able to order authentic homemade Goan Fish Curry and have it delivered home doesn’t hurt! TM: Who are FoodCloud’s major competitors in India? How do you differentiate yourself from other players? Vedant: We are a true marketplace for home cooked food and desserts. In India there are companies that deliver food from restaurants and also dark kitchens from where you can order food online. But there is no other organised marketplace for Home Food as of now. Since FoodCloud prepares food based on user’s choice, they can even customize the food which gives us an edge over most of our competitors. TM: What are the business opportunities in your sector, especially in the APAC region? Vedant: Customers globally are looking for healthier, cost effective, and customizable options and all these qualities are there inherently in home cooking. But with our modern lifestyles that result in lack of time and cooking skills, being able to get home cooked food delivered makes things convenient. Like India, the APAC region has a melting pot of cultures and a great history and tradition of cooking. We feel there is a big market beyond India, which we would like to explore in the future. TM: What are the challenges faced in your journey as an entrepreneur? Vedant: Entrepreneurship means problem solving. We face new challenges on a regular basis. When we first started out it was difficult to onboard new chefs as they had never heard of such a concept but today we get close to 80 new registrations every month. TM: Have you raised funds so far? What are your future plans? Vedant: Yes, we have raised an angel round and now we just raised a round from SOSV a VC Accelerator as part of their Food-X accelerator program. This program gives us access to some of the best most experienced people from the food and tech industry. We are super excited about this! TM: What keeps you going? Vedant: Being able to involve so many home chefs and being able to give them a platform to serve authentic mouthwatering food to people while earning money excites us. We hope to be in 5 cities with 3000 home chefs over the next 12 months. TM: What are your messages for budding entrepreneurs/young generation? Vedant: Persevere. You will face challenges but that is why you become an entrepreneur.